A selection of memorable moments captured on camera during the 2013 MotoGP season. Here are a selection of memorable moments - thrills, spills and celebrations - captured on camera during the 2013 MotoGP season. Part one features the first eight rounds of the year, in chronological order, with the second half of the season to follow. Round 1, Qatar (MotoGP): The 2013 season starts under the floodlights in Qatar. Round 1, Qatar (MotoGP): Defending world champion Jorge Lorenzo wins at Losail, while team-mate Valentino Rossi fights his way to second on a memorable Yamaha return. Round 1, Qatar (MotoGP): Rookie Marc Marquez signalled his arrival by challenging Rossi in the closing stages and claims a podium in his first ever MotoGP race. Round 2, Texas (Moto2): The inaugural MotoGP event at the Circuit of the Americas gets underway. Round 2, Texas (Moto2): 20-year-old Marc Marquez becomes MotoGP's youngest ever race winner. Round 3, Spain (MotoGP): Cal Crutchlow's Monster Yamaha Tech 3 machine scales a trackside barrier in practice. Round 3, Spain (MotoGP): Danilo Petrucci's Ioda Suter-BMW hits mechanical trouble. Round 3, Spain (MotoGP): More woe for Ioda as Lukas Pesek falls. Round 3, Spain (MotoGP): In what would become a frequent sight this season, Marc Marquez drags his elbow. Round 3, Spain (MotoGP): Marc Marquez and Jorge Lorenzo clash over second place at the final corner of the race. Round 3, Spain (MotoGP): Dani Pedrosa took his first win of the year at Jerez. Round 4, France (MotoGP): Cal Crutchlow takes his first podium of the season - in Tech 3 Yamaha's home race. Round 4, France (MotoGP): Dani Pedrosa claims victory in the only wet race of the year. Round 5, Italy (MotoGP): Andrea Dovizioso takes a heavy hit during practice for his first home event as a Ducati rider. Round 5, Italy (MotoGP): Marc Marquez suffered several falls during the Italian Grand Prix weekend. Round 5, Italy (MotoGP): Cal Crutchlow takes a look behind. The Englishman finished third in the race. Round 5, Italy (MotoGP): Jorge Lorenzo wins his second race of the season. Round 6, Catalunya (MotoGP): Frightening moment for Bradley Smith during practice. Rookie Smith went on to claim sixth place in the race. Round 6, Catalunya (MotoGP): Jorge Lorenzo joins the elbow-down club. Round 6, Catalunya (MotoGP): Yonny Hernandez gets his PBM run ART sideways. Pramac stand-in Michele Pirro follows. Round 6, Catalunya (MotoGP): Alvaro Bautista falls on the opening lap of the race, narrowing avoiding a clash with Valentino Rossi for the second grand prix in succession. Round 6, Catalunya (MotoGP): Satellite star Cal Crutchlow falls with the race leaders in sight. Round 6, Catalunya (MotoGP): Jorge Lorenzo beats countryman Pedrosa and Marquez for home victory - offers trophy to Anna Vives, who designed his helmet. Round 7, Assen (MotoGP): Despite breaking his collarbone in practice, then flying back to Spain for surgery, Jorge Lorenzo returns to Assen and finishes fifth in the race! Round 8, Germany (MotoGP): Fellow title contender Dani Pedrosa is also forced out of the race after damaging his collarbone in a separate practice incident. Round 8, Germany (MotoGP): Hector Barbera drops his Avintia Blusens while following Stefan Bradl. Round 8, Germany (MotoGP): Top CRT rider Aleix Espargaro (#41) fights with the factory stars early in the race. 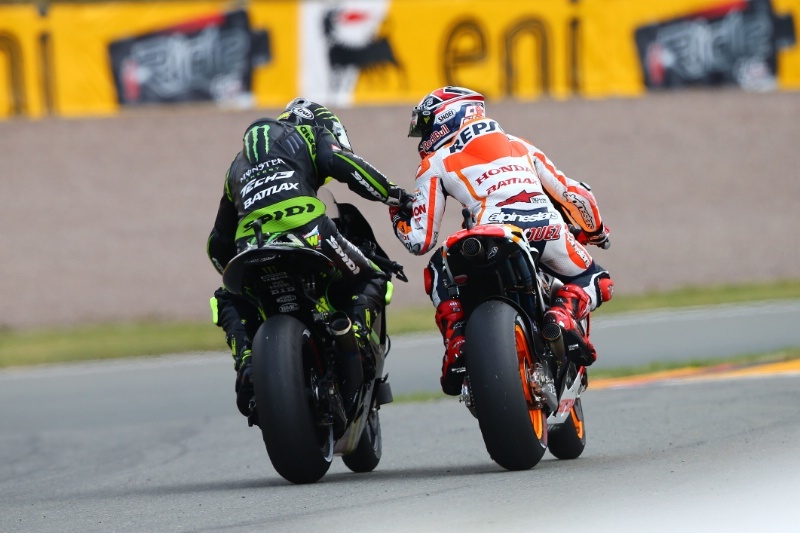 Round 8, Germany (MotoGP): Marc Marquez inflicts maximum damage on his absent title opponents with victory at Sachsenring - but satellite star Cal Crutchlow was just 1.6s behind at the chequered flag.